I am always awed by the old buildings whenever I pass through Escolta in Manila. The whole stretch of this street, from the east end of Jones Bridge to Santa Cruz Church, is flanked by buildings that have decorations that hint of early 20th Century architecture. The old buildings of Escolta Street (Calle or Kalye Escolta) made think that it is a prominent place in the past. The image below, taken in the 1960s, says that I was not wrong. Dennis Villegas said that Kalye Escolta is the shopping center of the rich and families during the age of early 20th Century. Kalye Escolta had plenty of luxurious shops. This street also witnessed many “firsts”. Mr. Villegas said that it is in Kalye Escolta where the first ice cream parlor was established (Clarke's Ice Cream), the first cinema house was opened (Cinematografo), and the first trambiya (electric cable car) was installed. The prominence of the Old Kalye Escolta is now gone. Only the old buildings remained to remind us of the old days. Let us start our “photo-tour” from the east end of the Jones Bridge. The most conspicuous building at this end of Kalye Escolta is Savory, which is famous for its fried chicken. This building is the original restaurant of Savory. An officemate said that the other Savory restaurants located in the malls and other places are owned by the siblings of the owner of this Savory Restaurant. The grey building on the left is the dilapidated building of Universidad de Manila. I believe that this building is already dangerous for the students and teachers of the university. The building will easily collapse when an earthquake occurs. Syvel's Building located at the right side of the photo is also another hazard. Last year, every morning, I see many old people lining up beside this building. They were waiting for the opening of the Ceragem Office located on the other side of Kalye Escolta. Ceragem offered free use of their products. The buildings on the left side are few of the remaining American Era buildings that are in good condition. The dome of Santa Cruz Church can be seen on the background. Walking further, we will see this white building which is obviously an American Era building. This building is the Regina Building which is rented by PLDT, JRS, DHL, Union Bank and a barbershop on the ground floor. This is the front side of Regina Building. The photo also shows the condominium building that is currently under construction. I think that the old buildings of Kalye Escolta will give way to condominiums, like what is happening now along Ongpin in Binondo Chinatown. Kalye Escolta crosses this dirty creek. Garbage is usually present on this creek, which is the usual case for creeks of Manila. Located beside the creek is a marker erected by the National Historical Institute. The marker speaks about the Patricio Mariano who is a poet, novelist and journalist. He was an adviser of the first president of the Philippines, Emilio Aguinaldo. I wonder what will Patricio Mariano think if he discovered that his marker is located beside a dirty creek. Kalye Escolta ends at Santa Cruz Church. 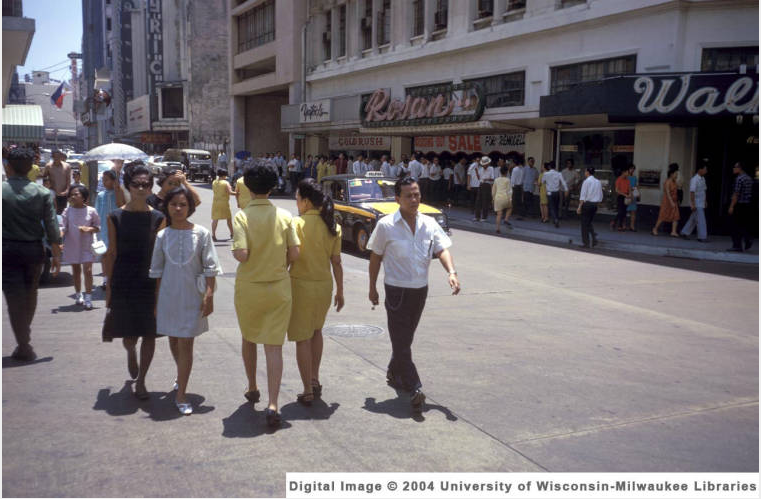 Looking at the old photo of Kalye Escolta makes me wonder what happened to Manila? Why did the splendor of Old Manila replaced by its poor condition, which is now the subject of mockery of foreigners? I wish to see Manila to return to its former beauty. Let go of your fear. :-D Ma-enjoy mo maglakad-lakad around Manila. There are a lot of things to see in Manila despite of its grime. ay! maganda sana kung malinis yung creek ano? tapos me mga small tables for people who wants to chillax? hehehe. ang old ng lugar. parang Butuan City. Oh no!! The old buildings will be making way for modern condos? Very excited for my Bangkok posts? Don't worry Foong, it will come. Baka dinala ka na ng parents mo dito noong ikaw musmos pa lamang kaya pamilyar sa iyo ang Escolta. Ganyan pala itsura ng kalye Eskolta nung 1960! Napabayaan kasi ang creek na yan dyan kaya ganyan kadumi. Tama ka Jen. Yung mga estero ang unang linisin kasi walang silbi na linisin ang Ilog Pasig kung pinababayaan na marumi ang mga creek. It is always nice to savor manila's good old days. I hope that we invest more in reconstructing historical buildings. That way, we can still savor the old glory manila had. That is my hope too. Too bad that many old building were already gone due to lack of interest to uor cultural heritage. Can you name the old building that was built in Spanish time tha one with caryatid figures, that housed tha Singer sewing machine store and the Fotografia Inglesa photo studio ? Many thanks po. God bless. Is the building that you're referring to was included in the above photos?